The Indiana Glass Company, of Dunkirk, Indiana, was established in 1907. Initially known for their industrial pressed glass, such as auto head lenses, they began to make addition glass items, such as soda fountain items, restaurant ware, and crystal ware. They were successful and continued to grow, making both hand-made and machine-made glassware. 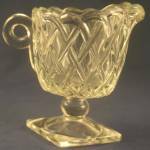 Indiana produced some of the more popular Depression Glass patterns, including Avacado (considered by some as the first Depression Glass pattern), Tearoom, Sandwich, #612 Horseshoe, Indiana Custard, and Pyramid. From 1970 until 1998 they created a subsidiary called Tiara, selling glassware through home parties. Pieces of Pyramid, Avacado, Sandwich, and Tearoom were re-introduced in new colors. The Lancaster Lens Company and Indiana Glass merged in 1955. In 1962 Indiana became part of the Lancaster Colony Corporation. Overseas competition, the loss of the K-Mart chain of stores, as well as a protracted and bitter strike ended the company's operations in 2002.